For the non-Spanish speaking members of the audience, it means I'm a Fantasy Football Loser. The Victors Took Their Spoils. To the Boldin Beautiful League loser, goes a year of shame. Our readers pointed out that Team Vega won only one matchup the entire season and was dead last. So, like the caring friends, brothers, and fellow leaguers we are, we decide his punishment would be 365 days of ridicule. 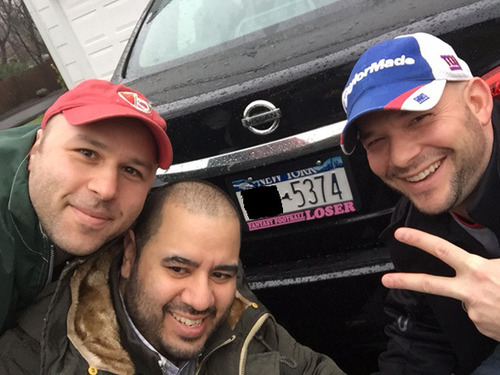 The loser presentation included a trophy in the form of a ballet dancer and a license plate frame that reads, “I Finished Last in my Fantasy Football League.” Team Vega must keep the license plate frame on his car for 365 days, no exceptions. The shame of riding around with the frame will be hilarious. But what was funnier was the Mission Impossible inspired manner that we got the frame onto his car. We can’t go into detail here, but suffice to say it involved, power grids were hacked, a team owner was drugged, and a grappling hook was used. To Team Vega better luck next season. Perhaps you should read FTS more often and learn from the head writer. Packers Lose: Will Olivia Help Rodgers Recover?